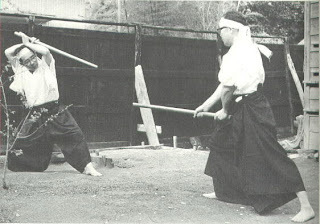 "Harboring the idea of a foe goes against the fundamental principle of all Japanese classical martial disciplines... a confused mind turns against itself and is its own enemy", wrote Donn Draeger. And as one sixteenth century kenshi was credited with saying, "I use my swords only to vanquish my own selfish desires." Unfortunately for many, the martial arts becomes a narcissistic, self-centered activity. Classical budo teachings warn against the workings of an egoic mind. Training, meditation, and kata practice are tools the martial arts aspirant use to develop appropriate right action to any given situation. Through training, the student becomes transformed. Self-importance, vanity, false pride, all fear-based behaviors, are replaced by positive attributes such as humility, calmness and inner peace. The higher-self always wants to be known, and positive change and transcendence are always available to the serious budoka. Another benefit that can be derived from training especially in today's modern world is that martial arts is one of the best stress management tools.